Dr. Murray Korc received his M.D. degree in 1974 from Albany Medical College in Albany, New York. He completed internal medicine residency training at Albany Medical Center Hospital in 1977, and his training in endocrinology fellowship training in 1979 at the University of California, San Francisco. He is the Myles Brand Chair in cancer research at Indiana University Simon Cancer Center and the Director of Pancreatic Cancer Signature Center. Dr. Korc is board certified in internal medicine and in endocrinology, diabetes and metabolism. Dr. Korc has been an active member in several national and international societies. He is a former president of the American Pancreas Association, an organization devoted to research in pancreatic disorders. 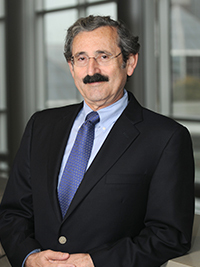 His NIH-funded research focuses on mechanisms of action of growth factors and their receptors in pancreatic carcinogenesis, and has both basic science and translational components. Dr. Korc has approximately 225 publications in peer reviewed journals, is an active member of many clinical and research societies, and sits on several Editorial Boards and a National Cancer Institute study section.